The Welsh Cobs were birthed and evolved from the Section A Welsh Mountain Pony. In the 18th and 19th centuries, outcrosses to Norfolk Roadsters, Hackneys, Arabians, some English Shires, and possibly others resulted in the modern Cob. Cobs were employed as riding horses for the British Cavalry, reliable mounts for traveling doctors, farmers, and other working people, as well as carriage, cart, cab, and wagon animals in the cities. The proper cob has explosive trotting action and is unsurpassed in stamina and courage. Very talented in all spheres of sport and pleasure, Welsh cobs are in demand as both saddle and harness animals. Currently, they are becoming very competitive in the hunter and dressage world, as well as Combined Driving Events and show harness competitions. The Welsh Cob is actually a pony breed despite having no maximum height in its breed standard and has existed for centuries in Wales. The original Welsh Mountain Pony is believed to have evolved from the Celtic pony of prehistoric times. Fragments of harness and bit found in Wales dating from the bronze age suggest, from their size, that ponies 12hh, (Hands High – 1 hand being 4 inches) and under and were being used for harness work. Welsh ponies existed in the British Isles prior to the Roman Empire occupying the area. Running mostly in bands as wild ponies, they developed hardiness, speed, endurance, intelligence, sure-footedness, and a coat and hooves that could withstand the harshest of conditions. In medieval times the “Rouncey” or the “Rowney” were trotters and very strong, active Cobs. The “Destrier” was a war horse that would take knights into battle wearing the very heavy armor of the time period, and because of their strength and speed, they could easily gallop into the battlefield. This horse was continually being imported from other areas and was extremely expensive, and because of this knights could usually only afford one and possibly another as a backup. The squire would lead the destrier when the knight was not engaged in battle, while the knight rode a pacing horse. The squire would ride a rouncey (or cob) that had the stamina to trot alongside the much larger destrier, who was a natural trotter. The squire would lead another rouncey carrying supplies and armor. If a destrier was killed, the knight could mount one of the rounceys and ride back into battle. They were very valuable as remounts for armies as they were “remarkable for their majestic proportion and astonishing fleetness” (Gerallt Gymro, 1188). Gymro also noted in his account of Wales that these mid-Wales Powis, or Powys, horse (the Welsh Cob) had derived their origin from fine Spanish stallions that Robert de Belesme, Count of Shrewsbury, had brought into the country. Following the Crusades, Arabian stallions brought back to England and Wales by the returning Crusaders were bred with the more heavily boned native ponies, producing the body and height for war and farming. During Henry the 8th’s rule, in 1535, the king made a proclamation that all stallions under 14 hands in height and all mares under 13hh could not be bred and must be destroyed. A bit later, Henry issued another law that banned the use of any stallions under 15hh. The Welsh rebelled and either hid their ponies or released them into the mountains and desolate rugged areas so that they would survive. Only the strongest of the ponies and horses lived. Once the law was repealed by Queen Elizabeth, the horses and ponies were much hardier. What looked like a disaster may have actually improved the breed. The Welsh finally got a large pony or small horse that could pull a plow, jump and run fast in the hunt, pull a carriage, and be ridden by a child or even a very large adult. The small but strong Welsh mountain ponies were used in harness in the coal mines to move the heavy loads in tight quarters. Before the stud books were created, a Welsh Cob stallion had to be hitched to a cart or buggy, and with two people on board, travel 35 miles uphill from Dowlais to Cardiff, Wales, in under 3 hours to be considered worthy of being bred. 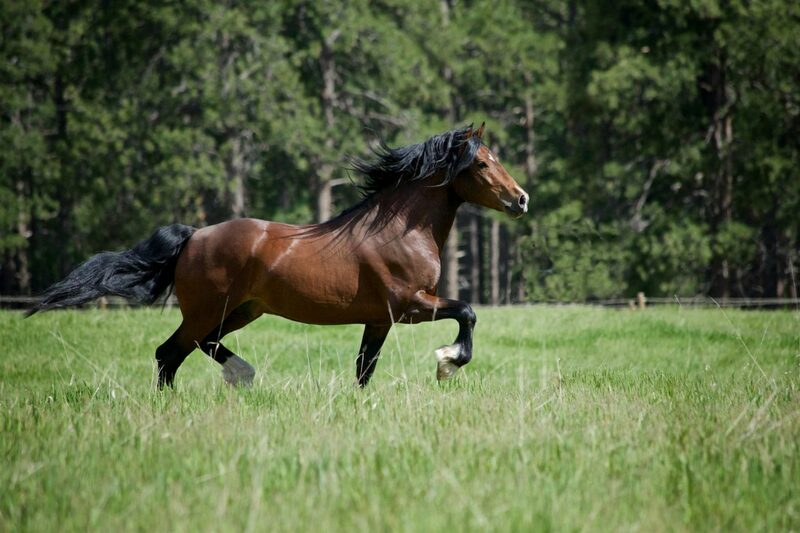 Stallion owners often had races to prove that their stallion was superior to the others. Stallions for service were led or ridden from town to town, farm to farm, about the countryside, and the stud fees were a major source of income for the owners. In the late 1800s, Welsh breeders infused hackneys, of a much fuller body than what is now seen in the breed, to create flashy carriage horses. Some of this breeding produced fine moving, full-bodied ponies and cobs. Unfortunately, some of it produced “weeds”, ponies that were not considered to be showing desirable traits. Another unfortunate infusion came with the English Shire to produce Colliery horses. With that infusion often came a coarse Roman head, bone that was too large, and clumsiness, which was not at all the goal of historically correct and responsible breeders. That type of breeding is rather evident to this day in some of the very coarse cobs entering many of the show rings and found on the breeding farms. In 1901 the Welsh Pony and Cob Society was created in the UK beginning the formal registry of the Welsh breed, finally dividing them in 1949 into four sections according to type and height. The four sections are: the Welsh Mountain Pony (Section A) under 12.2hh, the Welsh Riding Pony (section B) under 14.2, the Welsh Pony of Cob Type (Section C) a pony of A, B, C, and D mixed blood not to exceed 13.2hh, and the Welsh Cob (Section D) the largest of the breed starting above 13.2 extending up to any height. The description of all four sections is quite similar. The part-bred registry was added in 1950. The Welsh Pony Society was formed in the USA in 1907, but it didn’t include the Welsh Cob until the 1960s. Carefully selected Welsh Cob sires were awarded premiums, with owners being paid by the government, to keep the cost low or free for the mare owners and raise the standard of breeding to what had historically been the proper Welsh Cob. The two world wars wreaked havoc on the Welsh Cob, with hundreds or thousands of these versatile, courageous, willing, strong ponies and horses being commandeered into the military war effort, most of which were never returned to Wales. During the depression, owners couldn’t afford the cost of registering their mares and foals, so many fine and purebred cobs went undocumented. By the end of WWII, there were about twenty-five mares and ten stallions left in the stud book. At that point, a number of mares that were considered to be of true Welsh Cob type were added to the breeding pool and labeled as foundation stock (FS on the papers). The use of foundation stock is no longer permitted, ending somewhere around 1950. Breeding is now very strict in not allowing any outside infusion or cross-breeding that is registered as a full Welsh Cob, although part-breds may be registered as such.The breed has more lately been distributed in areas such as America, Canada, Germany, Norway, Sweden, Australia, New Zealand, Europe, Russia, and in areas of Africa. The Cob is often cross bred with the Thoroughbred to produce an athletic, hardy, durable horse that is well known in jumping (cross country and arena) and dressage circles. Cobs cross well with just about any breed, adding bone and substance, endurance, and character. The modern Cob is an athletic animal that excels in almost every discipline. They are very willing, talented jumpers. Many owners prefer to compete in dressage with their animals. They take readily to English or Western training, although those with the “bigger” movement are naturally better suited to being ridden English or driving. Their courage, enthusiasm, and endurance make them a strong competitor in Combined Driving, whether in the pony or horse division. They are powerful and reliable mountain horses, being sure footed and not easily frightened. A small Cob can carry a large man all day without complaining, and pack or pull very heavy loads. One of the greatest selling points for the Cob is their natural affinity for people. They seem to love being with humans and will want to be involved in whatever their humans are doing in the pasture. Poets, over many centuries, have revealed and extolled the virtues of the Welsh Cob. (There is) a chamlet as a covering for this young stag. And when he wished, trot with a high short step. He will not cut with his hooves even eight blades of grass. He would read his mind.